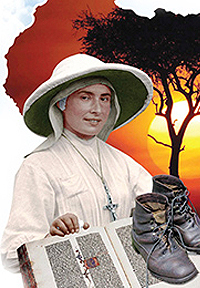 Sister Irene was born at Anfo, Brescia (Italy) on August 22nd, 1891. At the age of 20, attracted by the Missionary Ideal and feeling called by the Lord whom she loved intensely, she joined the Consolata Sisters’ Institute at Turin that had been founded by the Blessed Joseph Allamano. Having taken the first vows on January 29th, 1914, Sr. Irene soon received the “Mandate” for the Mission of Kenya, which she reached in January the following year. Those who remember her springing figure attribute her motivation to love. In October 1930, Sr. Irene offered to God her life for the Mission. Her mortal remains rest in the church of Our Lady Consolata at Nyeri in Kenya. In the 1984 the Beatification cause was introduced in the Church of Nyeri, Kenya and in the one of Turin, Italy. On April 2nd, 2011, Pope Benedict XVI authorized the issue of the Decree on her “Heroic Virtues” and Sister Irene was proclaimed Venerable. The miracle attributed to the intercession of Sr. Irene Stefani, which opened the way to the Beatification Process, was one of multiplication of water in the Baptismal fount of the Parish of Nipepe (Diocese of Lichinga , Niassa, Mozambique); water was used for four days by about 270 persons sheltered there to escape the violence of the civil war. The process of the inquiry was concluded with the final approval of the Pope Francis who, on June 12th 2014, put his signature to the Decree of the Beatification of Sister Irene Stefani.